Description: Herb with small rhizome; roots fibrous. Leaves annual, 0–3, ± linear, 6–25 cm long. Flowering stems striate, 15–65 cm long, ± glabrous or shortly hirsute near base and becoming glabrous above, branching, occasionally 2 or 3 branches at a node; umbels 1–5-flowered, terminal on branches, occasionally further sessile ones below, enclosed within bracts; pedicels 6–11.5 mm long, articulate near base, elongating in fruit. Tepals 10–14 mm long; outer tepals 1.5–2 mm wide; inner tepals 4–9 mm wide including fimbriae to 4.5 mm long. Stamens 6; anthers twisted, outer 3–4 mm long and straight, inner 6–9 mm long and curved, dehiscing by terminal pores. Style 8–9 mm long. Capsule c. 4 mm diam. 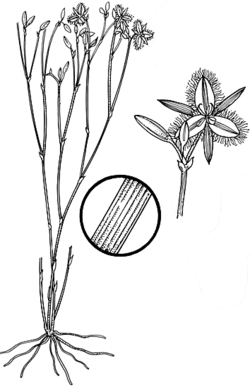 Distribution and occurrence: Grows in tall to low sclerophyll forest and heath often in swampy situations; coastal districts south from the Hastings R., inland to the Blue Mtns and Braidwood.